Just like a human, the best way to keeping your dog's teeth clean is a bit of brushing. Some people brush their dog's teeth almost daily -- at least weekly. If you start slow, and young, you'll have an easier time of doing it. But keeping the plaque off your dog's teeth is the best way to reduce the need for costly vet cleanings, gum disease, tooth extraction, and other health issues. EDITOR'S NOTE: It's not easy to get pictures of teeth brushing, but we are working on it for easy visuals! Toothpaste comes in all kinds of flavors these days. We use a peanut butter flavored gel the dogs really like. Let them try it with a little on your finger. Let THEM lick it off your finger. By letting them try it on their own, they get used to the texture, the smell, the flavor, so they know it's a kind of treat. The next step is to get your dog used to brushing. One common tip is to wrap gauze around your finger and use small rotating strokes. Make sure to work in sections. Use a downward stroke to help get the plaque off. Once your dog is used to the finger, you can transfer to a finger brush or a regular toothbrush. That's it! Easy, right? Of course, your dog has to agree to getting it done. So pack patience and be persistent. Try to do each step every day or close to every day for a few weeks. 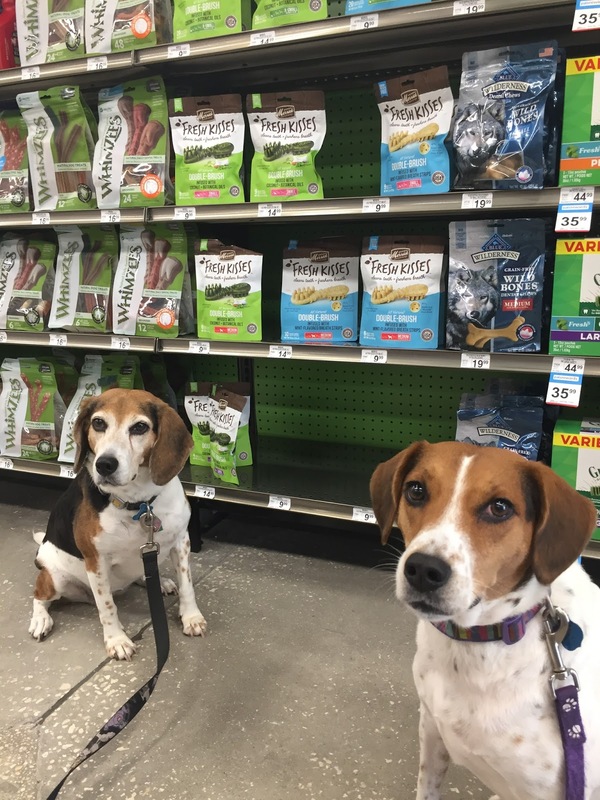 There's nothing a dog likes more than shopping for treats. Dogs that are active chewers are known to have less plaque on their teeth. So you want a good chew for your dog, based on their size and how much of hard chewer they are. Some dogs are harder than others. 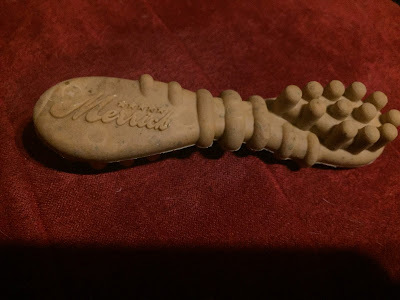 Merrick Fresh Kisses treats are not incredibly hard, but they have dual brushes, which means extra bristles for dogs to chew on. There are two types of Fresh Kisses treats -- one infused with mint breath strip pieces and spearmint oils. The other treat is made with coconut oil, along with peppermint, lemongrass and rosemary oils. Merrick Fresh Kisses treats have brush bristles on both sides to help scrape plaque. We prefer the ones with the mint breath strips, or at least Lulu does. Jasmine likes the one with coconut oil. 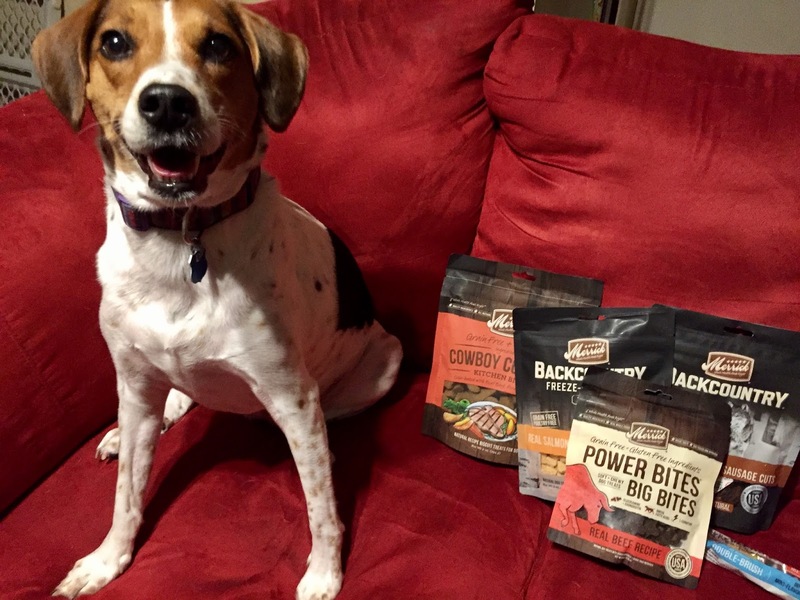 The treats are also grain-free and potato-free, for those who look for that in dog food and treats for their pets. They use pea starch and tapioca starch instead. And all of the ingredients are made and farmed in the USA. 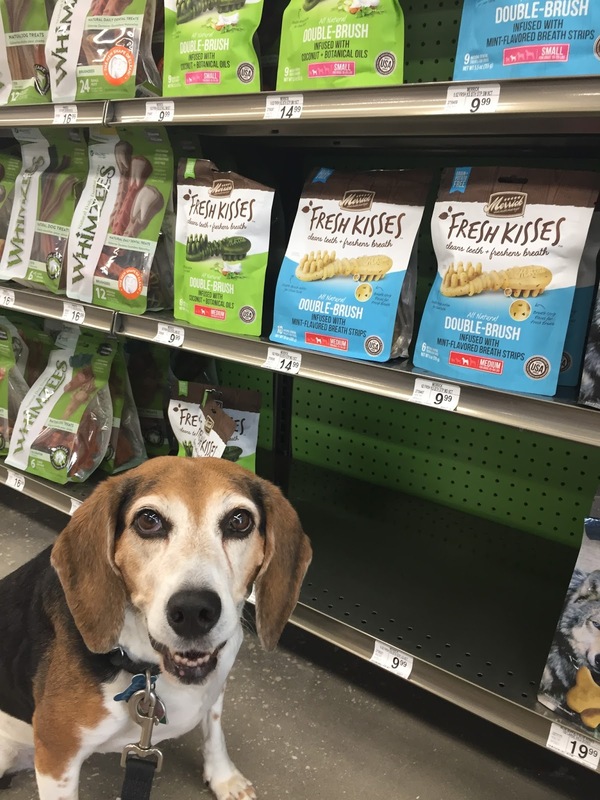 You can find Merrick Fresh Kisses treats where ever you find Merrick products, including Petco, Pet Supermarket, boutique stores and Amazon. I suggest trying the whole Merrick treat line! Be sure to try the whole Merrick treat line! NOTE: Treats are not a substitute for regular dental care, which should include brushing. We are a big fan of greenies! My pup goes CRAZY for Greenies! I always give my pup Greenies as well. The truth is that I really don't. I buy Greenies and other products for them to chew (I would love to try these), but they have expensive dental cleanings where they have to be knocked out usually. In fairness to me, all of my dogs are rescued seniors so they often come with lifetimes of neglect to catch up on. With a regular toothbrush and dog toothpaste! I brush Aspen's teeth a few times per week (would do it more frequently but she's not the biggest fan, so it takes some patience!). She also gets dental treats from a variety of different brands, including the other Merrick kind. Henry just had a dental and we need t keep them squeaky clean! We would love to give these a try! Want to keep our pups teeth healthy!! I just started brushing my senior dog's teeth, but she is lucky and has great teeth. She loves greenies and other dental treats. What is it about greenies that even pickiest pup loves them? I need to do better with my dogs teeth. I sometimes brush the,. I keep my dogs (and cats) teeth with spray, brushing, dental treats and chews. Brushing teeth here is an interesting affair, but important, so I get it done! I love the hard chews, and we use a lot of raw bones for dental care here too! Great info! i brush them everyday. if they have tartar, i scrap it. I don't brush them. If I haven't been doing it, should I try to start brushing them? I brush them 3 times a week! I bought bacon flavored toothpaste for dogs and actually brush her teeth. I think she'd like this much more! Well, we had our dog just pass away and we always used greenies, and regular toothbrushing with doggy toothpaste. We'll be picking up a new puppy on Wednesday and will likely be doing the same routine. Nothing worse than sloppy gross stinky dog breath kisses! With greenies for treats and yearly vet cleanings.